Interesting Facts: A Latias also appeared in Pikachu's Ocean Adventure where, along with Latios, it used its powers to help Pikachu, Meowth, and the other Pokémon search for the legendary "Wailord's Tear" beneath the ocean. A Latias appeared in SS025 under the ownership of Nurse Joy. It was used against Forrest's Rhyperior in a battle to prove Forrest's capabilities as a potential Gym Leader, where Latias proved victorious. NOTES: Start at the head and build by numbers until you get to the tail, glue the arms (using the base as a tool to glue them on the right position) and only after close. It's important to note that the arms are very heavy and the tube that holds them to the body is very small, so it may collapse if not reinforced with a tube of rolled paper inserted inside. The is not as hard as it seems, take your time, join one at a time to the hand and you'll be fine. 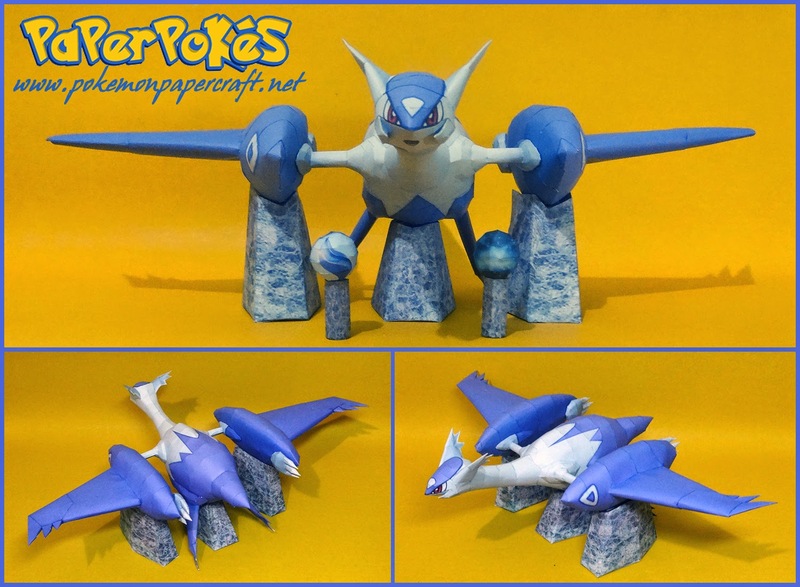 The medium-hard for Mega Latias is due to the hands, the pieces get small, and a bit harder to build, but besides that shouldn't be too hard. Further instructions included on the template. Base, Soul Dew, and Mega Stones included, as well as eye textures for Latias. The only difference for Latias is eye, and size.